Gardaí said there were no arrests and no incidents at the funeral. THE FUNERAL OF the former IRA chief of staff Ruairí O Brádaigh was attended by gardaí in full riot gear today. Gardaí said there were no incidents and no arrests at the event and that the gardaí in riot gear were present for ‘operational reasons’. Ó Brádaigh was Chief of Staff of the IRA from 1958 to 1959 and 1960 to 1962. He was also president of Sinn Féin from 1970 to 1983 and president of Republican Sinn Féin from 1987 to 2009. He joined Sinn Féin in 1950 and died on 5 June aged 80. Ó Brádaigh was imprisoned after taking part in the Teeling Column attack on Royal Ulster Constabulary barracks in County Fermanagh in 1956. He was elected a Sinn Féin TD for the Longford-Westmeath constituency in 1957. Email “Gardaí in riot gear attend funeral of former IRA chief of staff ”. 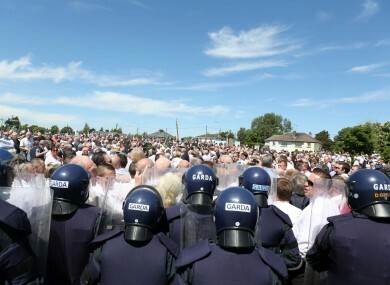 Feedback on “Gardaí in riot gear attend funeral of former IRA chief of staff ”.